Saturday night has proven to be devastating to drivers who were reported being at a stand-still for more than five hours. According to the news, hundreds of drivers and families were stranded on Interstate 57. One Herrin, IL resident spoke to media, sharing that she was heading back to Herrin with her family from an event in Mayfield, Kentucky when they got stranded in the northbound lanes of I- 57. The family had no food and less than a full tank of gas. Their seemingly simple hour and a half drive turned into a miserable nine-hour trip. The all too common risk of getting stranded during a winter storm prompts experts to advise drivers to have emergency supply kits in their cars every year. A typical kit contains provisions such as water, snacks, first aid kits, warm clothes, roadside kits, and mylar blankets which help retain body heat. These items, according to experts, are life-savers especially when one gets stranded in the snow. Surviveware, a maker of high-quality adventure and preparedness gear, has several products that can be used to address the safety and preparedness needs of travelers and outdoor campers. One of these products is Surviveware’s Emergency Mylar Blankets. The Emergency Thermal Blanket is a life-saver when it comes to securing one’s body temperature and keeping warm when a reliable heat source is not available. These blankets are designed to provide warmth and ensure survival during snow storms, and excessive cold brought about by wind and the polar vortex. Surviveware’s emergency blankets come in a pack of five and are stored in separate laminated bags. This individual packaging makes it convenient to store the blankets inside first aid kits, emergency supply packs, bug-out bags, and glove compartments. The thermal blankets fit over an adult-sized body. As such, an average adult will only need one sheet to cover an entire body. It’s made from durable, lightweight material which makes it an ideal add-on to first aid kits and emergency packs. The blankets are also sturdy enough to be used several times, giving its owners more value for their money without compromising quality and comfort. 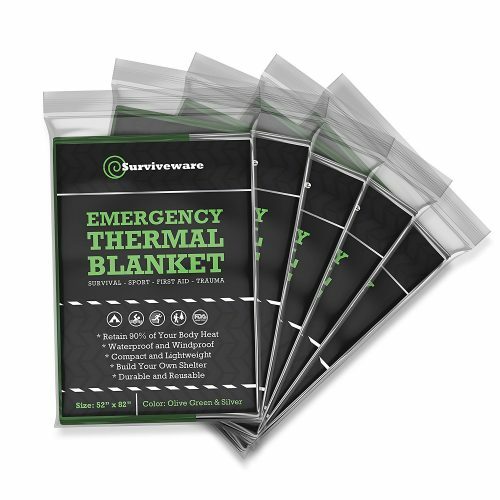 Prepare for the worst-case winter storm scenario and avoid shivering in the cold by stocking up on Surviveware’s Emergency Thermal Blankets. Purchase them today, and you’ll no longer have to worry about your family’s comfort during winter drives. Grab your set today by clicking here.